After a few years hiatus, 89.7 The River KIWR’s River Riot returns in 2019 with some of the best rock and metal bands currently touring. 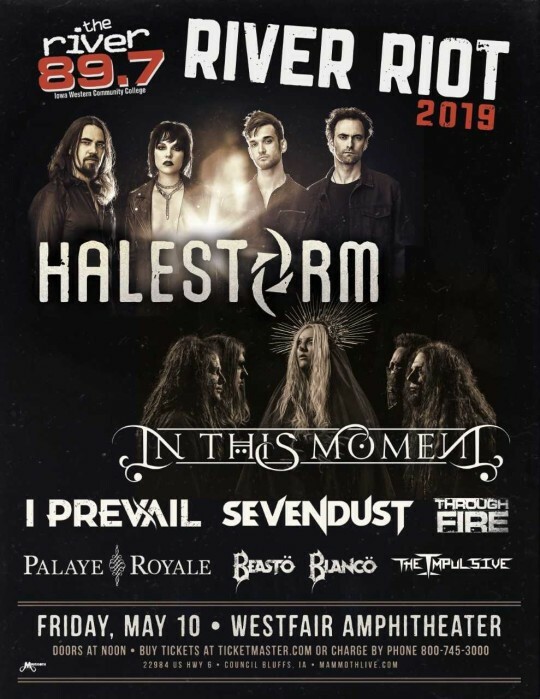 Announced last week, Halestorm and In This Moment released their spring 2019 tour route. The two powerhouse female fronted rock bands have shared the stage for numerous tours over the past five years and manage to sellout nearly every show they co-headline. Their paths will cross again this May for two Iowa dates, the first being May 9th’s stop in Cedar Rapids, Iowa. Information on tickets for Rock 108 PRESENTS Halestorm & In This Moment @ U.S Cellular Center can be found HERE. This Wednesday 10a thru 10p Thursday, after that the prices go up!